The World Geodetic System 1984 (WGS84) is an ellipsoid, datum and coordinate system (Archive) which is widely used in cartography, geodesy and navigation fields, including use with Google Maps. WGS84 represents the world with a spherical coordinate system. Such discussions on this topic often revolve around the claim that, since WGS84 provides accurate information and represents the earth as a sphere, it must be evidence that the earth is a sphere. When assessing this claim it is found that the process is a complex system which pulls information from a large collection of smaller flat maps to provide information to users. The spherical coordinates of the WGS84 are temporarily reprojected onto a map with planar coordinates in order to provide accurate geospatial data. 3 The Earth is Not Round! A Geographic Coordinate System is a spherical coordinate system which uses longitude and latitude. A Projected Coordinate System is a planar coordinate system. A Datum is an anchor point which ties two different coordinate systems (geographic and projected) together. The Earth is Not Round! NAD83, as we recall above, is based on a planar coordinate system. We are told that Web Mercator has unusable native coordinates. GIS data is temporarily re-projected onto NAD83 for usable measurement of distances. If this article were intended to show that the platform is displaying round earth distances and measurements, Utah would surely have titled the article something more along the lines of "The Earth is Round!" From the 'The Earth is Not Round!' article it is mentioned "The UTM NAD83 projection uses the GRS80 ellipsoid and a center-of-the-earth anchor point as its datum." It has been asked what the ellipsoid and center-of-earth anchor point that is associated with the NAD83 is referring to. 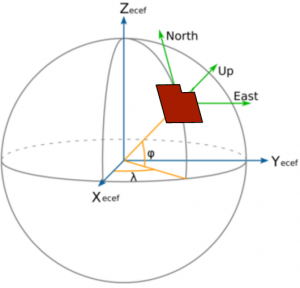 If the NAD83 is composed of state plane maps with a flat XY coordinate system, why is there a reference to involvement of a globe model? The answer to this is that the ellipsoid and anchor point datum associated with NASD83 is necessary to interconnect with other spherical coordinate systems such as WSG84, in order to connect correctly at the correct location and interchange data. The passage is speaking of anchor points to connect the two types of systems together. “ Geographic coordinates use latitude and longitude values to define positions on the 3D surface of the earth, which is of course, best modeled as an ellipsoid, not a sphere. Latitude and Longitude are useless for measuring distance and area because the unit of length, degrees, is not held constant for longitude, except along parallels -- individual perfectly east-west lines. We are told that the round earth model uses a latitude and longitude coordinate system. We also learn that latitude and longitude are not used. Could those who believe that the Earth is Not Round! article is describing a system which distributes round earth measurements kindly explain to us how it works without using latitude and longitude? We would really like to know. WGS84 relies on flat projections to give out accurate data. As we will recall from the definitions section, a geographic coordinate system is spherical and a projected coordinate system is flat. WGS84 has a spherical coordinate system and NAD83 has a flat coordinate system. This is a long list of the world-wide transformation tables used with ARCGIS, of which NAD83 is listed as one of them. These are all flat coordinate systems and their associated transformations. WGS 84 is taking data from flat systems because, as the "Earth is Not Round!" article describes, these flat systems give out more accurate figures. “ The State Plane Coordinate System was established to provide a means for transferring the geodetic positions of monumented points to plane coordinates that would permit the use of these monuments in plane surveying over relatively large areas without introducing significant error. Spherical coordinates are projected to the plane coordinates. Not the other way around. Further, they "must" be projected. We read that the geographic (round earth) coordinates can be projected onto a planar (flat earth) coordinate system to accurately display distances. The reader should ponder why spherical coordinates are projected onto a plane, and how spherical coordinates projected onto a planar coordinate system could display data and distances accurately if the earth is a globe. If the earth is a globe, the opposite should be true. Projecting spherical coordinates onto a plane should make data and distances more inaccurate, not accurate. The article goes on at length on the round WGS84 and the flat NAD83 coordinate systems. “ What is a geographic coordinate system? Of interest, some latitude and longitude coordinate transformations are not publicly known. “ Why are there so many transformations? We find several sources which describe that flat maps and plane surveying are the standard in GIS work. “ A decade or two ago, I was the instructor for some introductory surveying courses at a community college. In the first class we would define “plane surveying” as surveying that did not take into consideration the curvature of earth, and “geodetic surveying” as that which did. That was about the only time the two categories received anywhere near equal attention. Oh, we would point out (still in that first lecture) some of the real-world evidence of a non-flat earth, such as the fact that the length of an 11.5-mile arc on the earth's surface is only five hundredths of a foot longer than its subtended chord, or that the sum of the angles in a spherical triangle on the earth’s surface having an area of 75 square miles is only one second greater than the angle sum of the same size plane triangle. (Even today I get a kick out of those dramatic tidbits. I’m sure a real geodesist would roll his or her eyes at such trivia!) But those examples were used as reasons for not focusing—no, for not mentioning—geodetic concepts for the rest of the semester. We would end the ten-minute token nod to geodetic surveying with the tongue-in-cheek remark, “Therefore, for this class, we will respect the time-honored principle handed down through the ages—that the earth is flat.” And, truth be known, that’s probably not a bad narrowing of a dauntingly broad subject. This page was last modified on 21 April 2019, at 16:07.